It’s true that when you are either in the entertainment or in the sports industry, you need to consider your audience not as customers but as fans. Fans that are willing to do even the craziest things to attend a game of their favorite team or to see perform their favorite band. So now, with the most prestigious football event happening: The World Cup 2018 if you want to be part of the party and create great content to engage your audience and convert more clients, there are some things you need to consider. We will tell you what you need to check before you start creating your content as well as some tips of what to do to produce fan engagement and finally how Appocalypsis widgets will help you make everything happen. A-R-E Y-O-U R-E-A-D-Y? Chart the curse: the first step to develop fantastic content is to determine WHAT you want to achieve with it and HOW you plan to get there. Once you have this clear in your mind, it will be easier to set your budget and the KPI’s you need to track to achieve the goals you pursue. 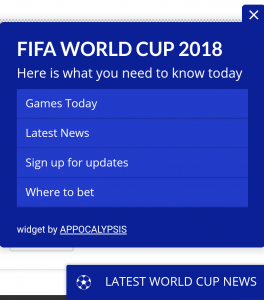 To gain more leads (what) by offering them exclusive information about the World Cup matches every day through a widget in our website (how). We planned to spend €200 in 3 weeks for SEM, and at the end of the campaign, we’ll have increased our customer’s database by 10% (KPI). Give yourself time to understand your audience deeply: for sports fans or hungry content searchers; you need to know what kind of content they like to consume the most (video, images, memes, infographics etc.) and where they want to find it (social media, search engines, mobile, etc.). By giving yourself a time to get to know your audience before start posting, your probabilities to maximize the exposure of your content will increase, and therefore your brand awareness. If they don’t perceive a differentiated and real value in what you offer, they won’t check it. Plan, test and evaluate: you can use this opportunity, not only to engage your audience and accomplish your marketing and sales goals, but you can also gain valuable first-party data from your audience if you give yourself the time to analyze the results. After you’ve made some posts, check what type of content the market prefer to consume, at what times, when and where they do it, so you can improve further your future posts and marketing campaigns based on robust data and not mere assumptions. Do you want to boost your fan engagement? Follow these simple tips. Let your audience be part of the party, enabling them to participate and interact with your content and show them you are interested in hearing what they have to say. Tweet surveys, ask for opinions on Instagram or post a video on Facebook to generate conversation with and between them. It’s important to not only generate conversation with the audience but let them personalize your content so you can gain more significant insights from them. This kind of material also will encourage them to participate, share, and talk more about your brand. 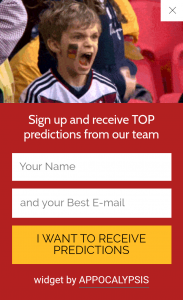 So how can you deliver your World Cup Content to your audience in a smooth, fast and customizable ways? We highly recommend you to implement one (or most of them) of our widgets that we specially made for this enormous opportunity to communicate whatever you want to your clients: The World Cup 2018 enthusiasts! Here are some ideas for you to get inspired. Enjoy! When you search “World Cup 2018” on the internet, the main headlines (of almost every article) are about statistics, prediction and game analysis. Well with this kind of widget you will be able to offer all of that from your website or wherever your audience is. Perks? To reach them in a simpler way. And of course, you will gain traffic to your site as well as some juicy leads too. Or what about some nice countdown to let them know when the matches will be or even when the World Cup will finish so they don’t miss a single second of the games or the closure of this magnificent event. But you can also let everybody know about news, updates, the schedules of the games or any other thing you want to tell your audience. The limit is your imagination! We have more amazing widgets like these for you to choose the one that fits best your goals. 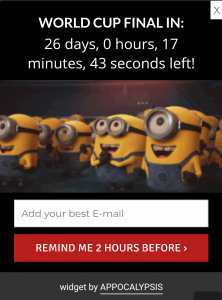 Moreover, if you have an excellent idea for one new widget we can make it just for you!